A friend recently found a cigar-shaped nest cell in the recesses of her window frame. Intrigued to discover what this had been, I did a quick search on Google and was surprised to find it had been home to the pupae of a Leaf-cutter Bee. The Leaf-cutter Bee, Megachile centuncularis is one of a number of small, solitary leaf-cutter bees that nest in holes in plant stems, dead wood, cliffs, old walls or in this case a window frame. They famously cut discs out of leaves (they particularly like roses), gluing them together with saliva in order to build the ‘cells’ in which their larvae live. They hatch and develop, pupating in autumn and hibernating over winter. The Leaf-cutter Bee is on the wing from April to August, and feeds solely on pollen and nectar. They hatch and develop, pupating in autumn and hibernating over winter. The Leaf-cutter Bee is on the wing from April to August, and feeds solely on pollen and nectar. They are similar to the Honey Bee but collect pollen on the hairs on the underside of their abdomen. The abdomen thus appears orange making it an easy identification feature.. It is best recognised by its habit of carrying pieces of leaf back to its nest; leaving semi-circular holes in the leaves of garden plants, which denote its presence. 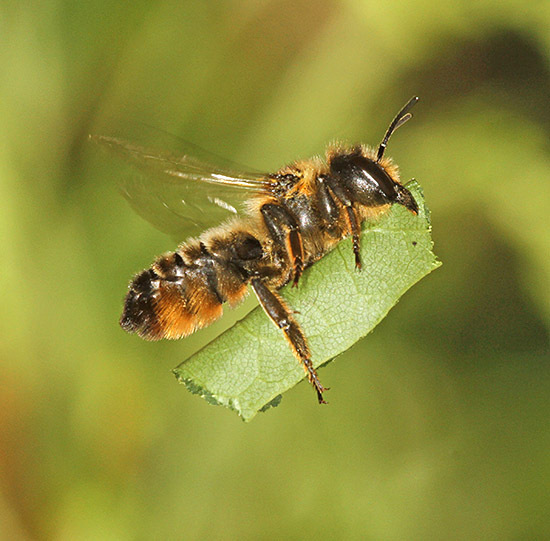 There are various species of leaf-cutter bee in Britain, which are very difficult to tell apart. Solitary bees and wasps are important pollinators for all kinds of plants, including those which we rely on like fruit trees. Surprisingly, in research, it was discovered that about 150 of these little bees working in greenhouses (or similar) can provide the pollination service of 3,000 honeybees! You can help to encourage bees and wasps into your garden by providing nectar-rich flower borders and fruit trees.